AMES, HARRIET A. MOORE PAGE POTTER (1810–1902). Harriet Ames, subject of an early Texas community-property case, the daughter of Francis Moore, was born on August 18, 1810. She left her home and small retail business in New Orleans and accompanied her improvident husband, Solomon C. Page, to Texas before the revolution of 1836. Not long after their arrival Page joined the army, abandoning Harriet and their two small children without provisions in an isolated house on the prairie surrounding Austin Bayou. They survived by gathering wild plants until they were finally rescued and brought to Brazoria, where Harriet sold some store goods she had brought from New Orleans and learned farming from her brother's wife. During the Runaway Scrape Robert Potter, secretary of the Texas Navy, took her and her children to Galveston under his protection and gave them refuge on a navy vessel until after the battle of San Jacinto. Refusing Solomon Page's plea for reconciliation, she journeyed to New Orleans with the intention of setting out for Kentucky to live with her grandmother. Potter, who was with her, offered to arrange the journey; but instead, he executed a series of deceptive maneuvers that ultimately took them back to Texas and his property on the Sabine River in Shelby (now Harrison) County. Harriet refused Potter's proposals of marriage until he convinced her that her marriage to Page was invalid in Texas because it had not been solemnized by a priest, and in September 1836 they were married by bond. They lived for a year on the Sabine while they built a home at Potter's Point on Ferry (Caddo) Lake in Red River (now Marion) County. They had two children, and Robert Potter served in the Fifth and Sixth Texas congresses; he assured Harriet that he had introduced a law in Congress validating marriages like theirs. Potter became involved in the Regulator-Moderator War, and on March 2, 1842, he was murdered by William P. Rose and a contingent of Regulators. When his will, made in Austin less than a month before his death, was probated, it revealed that he had left the land on which the homestead stood to a Sophia Mayfield of Austin, and another part of his headright and some horses, slaves, and all of the household furnishings and farming stock to Harriet, named in the will as Mrs. Harriet A. Page. 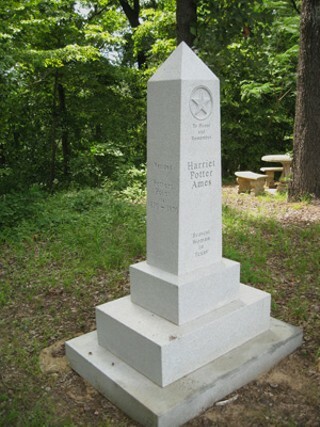 Harriet A. Moore Page Potter Ames Granite Monument at Caddo Lake in East Texas. Courtesy of Gerald E. McLeod and the Austin Chronicle. Image available on the Internet and included in accordance with Title 17 U.S.C. Section 107. Harriet remarried in August or September 1842, and with her new husband, Charles Ames, continued to reside on the Potter homestead. Sophia Mayfield died in 1852 without ever attempting to take possession of Potter's bequest, and it was sold by the administrator of her estate. In July 1857 the purchasers filed suit to try title against Harriet and Charles Ames. After years of amended pleadings the case of Lewis v. Ames was tried in Marion County District Court in April 1872 and judgment was rendered in Harriet's favor (Ames had died in 1866). The case was reversed and remanded by the Texas Supreme Court in 1875. The controlling issue was whether Harriet had been Potter's legal wife and was therefore entitled to assert a community interest in the property. Chief Justice O. M. Roberts held that the remedial statutes passed by the Texas legislature to validate irregular marriages contracted under Mexican sovereignty did not affect Harriet Ames's alleged bond marriage: Potter's failure to mention a wife or children among the enumerated beneficiaries and his reference to Harriet as Mrs. Page indicated that he did not regard their living arrangement as a marriage. Harriet was dispossessed from the property at Potter's Point and lived in New Orleans for many years with the children of her third marriage. At the age of eighty-three she wrote her reminiscences, which are now in the Barker Texas History Center, University of Texas at Austin. She died in Covington, Louisiana, on March 18, 1902. Louis Wiltz Kemp, The Signers of the Texas Declaration of Independence (Salado, Texas: Anson Jones, 1944; rpt. 1959). James Norvell, "Ames Case Revisited," Southwestern Historical Quarterly 63 (July 1959). Texas Supreme Court, Texas Reports: Cases Adjudged in the Supreme Court, Vol. 44. Handbook of Texas Online, Judith N. McArthur, "AMES, HARRIET A. MOORE PAGE POTTER," accessed April 21, 2019, http://www.tshaonline.org/handbook/online/articles/fam03.